1 IoT Platform ? ?2015	? InterDigital,	?Inc. ?All	?Rights	?Reserved. The	?Best	?of	?Both	?Worlds:	? Standards	?Based	?Solutions	? with	?Value	?Added	?Services Platform	?Highlights ? ?2015	? InterDigital,	?Inc. ?All	?Rights	?Reserved. 2 1	? ?	? ?	? ?2 3	? ? ? ? ? ?4	? ? ? ? ? ?5	? ? ? ?	? ?6	? ?	? ?	? ?7	? ?	? ?	? ?8	? ?	? ?	? ?9	? ?	? ?	? ?10	? ?	? ?	? ?11	? ?	? ?	? ?12	? ?	? ?	? ?13	? ?	? ?	? ?14	? ?	? ?	? ?15	? ?	? ?	? ?16	? ?	? ?	? ?17	? ?	? ?	? ?18	? ?	? 19	? ? ?	? ?20	? Rich Roadmap Interoperability Flexible Deployment >> Data,	?device,	?connectivity,	?transaction	?and	?security	?management >> Cloud	?&	?gateway	?software,	?API?s,	?and	?visual	?test	?&	?development	?tools >> Uses	?and	?interworks	?with	?existing	?industry	?protocols	?and	?alliances >> Ensures	?future-? ?proof	?solution	?with	?no	?single	?vendor	?lock-? ?in >> Quick	?go-??to-? ?market	?supporting	?versatile	?devices,	?networks	?and	?verticals >> Versatile	?distribution	?channels	?and	?business	?models	? (licensing,	?PaaS,	?ect.) is	?Scalable 3? ?2015	? InterDigital,	?Inc. ?All	?Rights	?Reserved. Non-? ?Resource Constrained loT Applications Scaled	?Up	?Cloud-? ?Based loT Service	?Layer	?Deployment Scaled	?Down	?Gateway loT Service	?Layer	? Deployment ! ! Resource Constrained loT Devices ! ! Scaled	?up API	?Messaging Scaled	?Down API	?Messaging 1	? ?	? ?	? ?2	? ? ? ? ? ?3 4	? ? ? ? ? ?5	? ? ? ?	? ?6	? ?	? ?	? ?7	? ?	? ?	? ?8	? ?	? ?	? ?9	? ?	? ?	? ?10	? ?	? ?	? ?11	? ?	? ?	? ?12	? ?	? ?	? ?13	? ?	? ?	? ?14	? ?	? ?	? ?15	? ?	? ?	? ?16	? ?	? ?	? ?17	? ?	? ?	? ?18	? ? 19	? ? ?	? ?20	? 4? ?2015	? InterDigital,	?Inc. ?All	?Rights	?Reserved. is	?an	?End-??to-? ?End	?IoT Platform	?Solution Devices Gateway Cloud	?Server Cellular,	? WLAN,	?WPAN (Zigbee,	? 6LoWPAN,	? Bluetooth),	? Wireline Enables	? cellular	? &	?non-??cellular	? M2M	? devices	? to	? communicate	? through	? ? operator	? networks.	? Provides	? localized	? Service	?Capabilities	? to	? offload	? network Service	? Provider?s	?M2M	? Service	? Platform,	? offering	? Service	? Capabilities	? to	? Diverse	?M2M	?Verticals	? (Device/	? Data	? Access,	? Device	?Management,	? Security,	? Billing	? Service	? Discovery,	? etc.) Healthcare Vehicular Energy Connected Home ! ! Cellular	? Core Network Standard	? API?s,	? Access,	? Security	? & Device	?Management	? Features Standardized	? API?s to	?Diverse	? Verticals Standardized	? API?s For	?Diverse	? Devices ! ! ! ! ! ! IP	?Network Apps Build	? apps	? that	? support	? a	? rich	? mashup	? of	?devices	? and	? data	? across	? multiple	? verticals 1	? ?	? ?	? ?2	? ? ? ? ? ?3	? ? ? ? ? 4	? ? ? ? ? ?5	? ? ? ?	? ?6	? ?	? ?	? ?7	? ?	? ?	? ?8	? ?	? ?	? ?9	? ?	? ?	? ?10	? ?	? ?	? ?11	? ?	? ?	? ?12	? ?	? ?	? ?13	? ?	? ?	? ?14	? ?	? ?	? ?15	? ?	? ?	? ?16	? ?	? ?	? ?17	? ?	? ?	? ?18	? ? 19	? ? ?	? ?20	? 5? ?2015	? InterDigital,	?Inc. ?All	?Rights	?Reserved. Services	?Enable	?App	?Developers GROCERY	? APP MARKET	? RESEARCH/	? SEARCH	?APP CAR	?CHARGING	? APP ENERGY	?MANAGEMENT	? APP APPLIANCE	? TEST/ TROUBLESHOOT/ UPGRADE	? APP GadgetDetective.iot VALUE	?ADDED	?SERVICES Discovery Location SearchSemantics Complex	? Event	? Management APPLICATION	?ENABLEMENT	? PLATFORM loT SERVICE	?PLATFORM Security M2M	? Gateway Content	?Mgmt. Data	? Collection Device	? Mgmt.	? Event	?Mgmt. Semantic	? Data	?Model Analytics Billing Data	? Adaptation,	?Aggregation Optimized	? Connectivity	? &	? Transport Raw	?APIs,	?Web	? Service	? Interfaces Device/	? Services	? Discovery Addressing	? ?& Identif ication Interactions	? between	? Diverse	? Devices	? and	?Applications-?? Traditionally	? Silo-? ?ed in	?Different	? Verticals,	? but	? Now	? Fully	? Interconnected Smart	? Meters PowerAid.iotZapMyCar.iotIStockIt.iot DataFetch.iot 1	? ?	? ?	? ?2	? ? ? ? ? ?3	? ? ? ? ? 4	?	? 5	? ? ? ?	? ?6	? ?	? ?	? ?7	? ?	? ?	? ?8	? ?	? ?	? ?9	? ?	? ?	? ?10	? ?	? ?	? ?11	? ?	? ?	? ?12	? ?	? ?	? ?13	? ?	? ?	? ?14	? ?	? ?	? ?15	? ?	? ?	? ?16	? ?	? ?	? ?17	? ?	? ?	? ?18	? ? 19	? ? ?	? ?20	? 6? ?2015	? InterDigital,	?Inc. ?All	?Rights	?Reserved. Interworks	?with	?Cellular	?Networks LTE	?RAN LTE	?Evolved	?Packet	?Core M2M	?System M2M	?Applications oneM2M	?Services Semantics 3GPP	?Inter-? ?Working Data	?Base	?Services Discovery CoAP or	?HTTP IP oneM2M	?Services Semantics 3GPP	?Inter-? ?Working Data	?Base	?Services Discovery CoAP or	?HTTP IP Cellular	? M2M	?Devices eNodeB MME S-? ?GW HSS MTC-? ?IWF PDN-? ?GW SGi Tsp M2M	?Server Application	? Servers 1	? ?	? ?	? ?2	? ? ? ? ? ?3	? ? ? ? ? 4	?	? 5	? 6	? 7	? ?	? ?	? ?8	? ?	? ?	? ?9	? ?	? ?	? ?10	? ?	? ?	? ?11	? ?	? ?	? ?12	? ?	? ?	? ?13	? ?	? ?	? ?14	? ?	? ?	? ?15	? ?	? ?	? ?16	? ?	? ?	? ?17	? ?	? ?	? ?18	? 19	? ? ?	? ?20	? 7? ?2015	? InterDigital,	?Inc. ?All	?Rights	?Reserved. has	?Device	?Management	?Services oneM2M	? interface oneM2M	? entity oneM2M	? CSF DM	?entity oneM2M-? ?DM interface DM interface M2M	?Device (oneM2M	? Application Dedicated Node) ADN-? ?AE DM	?Client M2M	?Device (oneM2M	? Application Dedicated Node) ADN-? ?AE LW	?DM	? Client M2M	?Gateway (oneM2M	? Middle	?Node) Mca MN-? ?CSE DMG Management	? Adapter DM	?Gateway LW	?DM Server DM Client MN-? ?AE M2M	?Device (oneM2M	? Application	?Service	? Node) Mca ASE-? ?CSE DMG Management	? Adapter DM	?Client ASN-? ?AE M2M	?Server (oneM2M	? Infrastructure	? Node) Mca IN-? ?CSE DMG Management	? Adapter DM	? Server IN-? ?AE Interface to	?DM Server Mgmt. ?Objs. M2M	?Device (oneM2M	? Application Dedicated Node) ADN-? ?AE DM	?Client DM	? Client Non	?M2M Device (NoDN) DM	?Server (OMA,	? DM,	? LWM	? 2M, BBF	? TR-??069,	? ect.) Mca Mcc Ms 1	? ?	? ?	? ?2	? ? ? ? ? ?3	? ? ? ? ? 4	?	? 5	? 6	? ?	? ?	? ?7	? ?	? ?	? ?8	? ?	? ?	? ?9	? ?	? ?	? ?10	? ?	? ?	? ?11	? ?	? ?	? ?12	? ?	? ?	? ?13	? ?	? ?	? ?14	? ?	? ?	? ?15	? ?	? ?	? ?16	? ?	? ?	? ?17	? ?	? ?	? ?18	? 19	? ? ?	? ?20	? 8? ?2015	? InterDigital,	?Inc. ?All	?Rights	?Reserved. has	?Charging	?&	?Eventing Service M2M	?Server Configurable	? Charging	? Service Chargeable Events Chargeable Events Charging Policy	? #n Charging Policy	? #1 Services Applications Field	? Domain z Underlying	? Network Charging	? System (3GPP	? Core	? Network Billing	?DomainBilling	?Domain Billing	?DomainField	?Domain 1	? ?	? ?	? ?2	? ? ? ? ? ?3	? ? ? ? ? 4	?	? 5	? 6	? ?	? ?	? ?7	? ?	? ?	? ?8 9	? ?	? ?	? ?10	? ?	? ?	? ?11	? ?	? ?	? ?12	? ?	? ?	? ?13	? ?	? ?	? ?14	? ?	? ?	? ?15	? ?	? ?	? ?16	? ?	? ?	? ?17	? ?	? ?	? ?18	? ?	? 19	? ? ?	? ?20	? 9? ?2015	? InterDigital,	?Inc. ?All	?Rights	?Reserved. has	?Security	?Services Healthcare Vehicular Energy Connected Home When	?an	?App	?attempts	? access,	?oneMPOWER?	? first	?authenticates	?the	? App	?and	?then	?checks	? with	?the	?iconectiv App-?? ID	?Registry	?whether	?the	? App	?has	?a	?valid	?ID	?and	?is	? authorized	?to	?connect oneMPOWER? ?support	? authentication	?and	? authorization	?of	?Apps	? attempting	?to	?access	? the	?platform 1	? ?	? ?	? ?2	? ? ? ? ? ?3	? ? ? ? ? 4	?	? 5	? 6	? ?	? ?	? ?7	? ?	? ?	? ?8	? ?	? ?	? 9	? ?	? ?	? ?10	? ?	? ?	? ?11	? ?	? ?	? ?12	? ?	? ?	? ?13	? ?	? ?	? ?14	? ?	? ?	? ?15	? ?	? ?	? ?16	? ?	? ?	? ?17	? ?	? ?	? ?18	? ? 19	? ? ?	? ?20	? Global	?App-??ID	? Registry 10? ?2015	? InterDigital,	?Inc. ?All	?Rights	?Reserved. www.interdigital.com/iot has	?a	?Web	?Portal	?for	?Developers oneMPOWER? ?support	? a	?developer	?Web	?Portal	?for	? download	?of	?the	?platform	? and	?a	?rich	?collection	?of	?tools	? and	?resources 1	? ?	? ?	? ?2	? ? ? ? ? ?3	? ? ? ? ? 4	?	? 5	? 6	? ?	? ?	? ?7	? ?	? ?	? ?8	? ?	? ?	? 9	? 10	? 11	? ?	? ?	? ?12	? ?	? ?	? ?13	? ?	? ?	? ?14	? ?	? ?	? ?15	? ?	? ?	? ?16	? ?	? ?	? ?17	? ?	? ?	? ?18	? ?	? 19	? ? ?	? ?20	? ? ?2015	? InterDigital,	?Inc. ?All	?Rights	?Reserved. has	?an	?Application	?Developers	?Kit	? (ADK) 11 oneMPOWER? ?supports	? extensive	?ADK	?including	? IDEs,	?API	?libraries,	?sample	? apps,	?debug	?tools	?and	?a	?rich	? mashup	?builder	?environment	? powered	?by	?ThingWorx to	? assist	?application	?developers //	?Create	? an	?AE	? resource ae.Create(); //	?Retrieve	? an	?AE	? resource ae.Retrieve(); //	?Update	? an	?AE	? resource ae.Update(); //	?Delete	? an	?AE	? resource ae.Delete(); 1	? ?	? ?	? ?2	? ? ? ? ? ?3	? ? ? ? ? 4	?	? 5	? 6	? ?	? ?	? ?7	? ?	? ?	? ?8	? ?	? ?	? 9	? 10	? ?	? ?	? 11	? ?	? ?	? ?12	? ?	? ?	? ?13	? ?	? ?	? ?14	? ?	? ?	? ?15	? ?	? ?	? ?16	? ?	? ?	? ?17	? ?	? ?	? ?18	? ? 19	? ? ?	? ?20	? 12? ?2015	? InterDigital,	?Inc. ?All	?Rights	?Reserved. has	?oneM2M	?Interop/Conformance	?Tools oneMPOWER? ?has	? developed	?a	?oneM2M	?interop	? and	?conformance	?test	?tool	? based	?on	?the	?open	?source	? Robot	?test	?automation	? framework	?project. The	?tool	?can	?be	?used	?by	? oneM2M	?developers	?to	?test	? their	?compliance	?to	?the	? oneM2M	?defined	?interop and	? compliance	?test	?suites 1	? ?	? ?	? ?2	? ? ? ? ? ?3	? ? ? ? ? 4	?	? 5	? 6	? ?	? ?	? ?7	? ?	? ?	? ?8	? ?	? ?	? 9	? 10	? ?	? ?	? 11 12	? ?	? ?	? ?13	? ?	? ?	? ?14	? ?	? ?	? ?15	? ?	? ?	? ?16	? ?	? ?	? ?17	? ?	? ?	? ?18	? ?	? 19	? ? ?	? ?20	? ? ?2015	? InterDigital,	?Inc. ?All	?Rights	?Reserved. has	?a	?oneM2M	?Traffic	? Generation	?Tool 13 oneMPOWER? ?has	?developed	? a	?Web-? ?based	?oneM2M	?traffic	? generation	?tool The	?tool	?can	?be	?used	?by	? developers	?to	?easily	?construct	? oneM2M	?message	?sequences	? to	?exercise	? their	?oneM2M	? services	?and	?applications 1	? ?	? ?	? ?2	? ? ? ? ? ?3	? ? ? ? ? 4	?	? 5	? 6	? ?	? ?	? ?7	? ?	? ?	? ?8	? ?	? ?	? 9	? 10	? ?	? ?	? 11	? ?	? ?	? ?12	? ?	? ?	? ?13	? 14	? ?	? ?	? ?15	? ?	? ?	? ?16	? ?	? ?	? ?17	? ?	? ?	? ?18	? ? ? ? 19	? ? ?	? ?20	? 14? ?2015	? InterDigital,	?Inc. ?All	?Rights	?Reserved. has	?a	?oneM2M	?Wireshark	?Dissector	?Tool oneM2M	? Protocol	? Messages oneM2M	? XML-??based	? Content InterDigital	?has	?developed	? a	?oneM2M	?Wireshark	? dissector	?which	?it	?has	? made	?freely	?available	?to	? the	?oneM2M	?community 1	? ?	? ?	? ?2	? ? ? ? ? ?3	? ? ? ? ? 4	?	? 5	? 6	? ?	? ?	? ?7	? ?	? ?	? ?8	? ?	? ?	? 9	? 10	? ?	? ?	? 11	? ?	? ?	? ?12	? ?	? ?	? ?13	? ?	? ?	? ?14	? 15	? ?	? ?	? ?16	? ?	? ?	? ?17	? ?	? ?	? ?18	? ? ? ? 19	? ? ?	? ?20	? ? ?2015	? InterDigital,	?Inc. ?All	?Rights	?Reserved. has	?a	?oneM2M	?Resource	?Tree	?Viewer	?Tool 15 oneMPOWER? ?supports	?a	? useful	?tool	?for	?visualizing	? its	? oneM2M	?resource	?tree. ?	? As	?Apps	?Create,	?Retrieve,	? Update	?and	?Delete	?resources	? within	?the	?oneM2M	?platform,	? the	?tool	?provides	?a	?GUI	?to	? allow	?visibility	?into	?these	? operations 1	? ?	? ?	? ?2	? ? ? ? ? ?3	? ? ? ? ? 4	?	? 5	? 6	? ?	? ?	? ?7	? ?	? ?	? ?8	? ?	? ?	? 9	? 10	? ?	? ?	? 11	? ?	? ?	? ?12	? ?	? ?	? ?13	? ?	? ?	? ?14 15	? 16	? ?	? ?	? ?17	? ?	? ?	? ?18	? ?	? 19	? ? ?	? ?20	? 1	? ?	? ?	? ?2	? ? ? ? ? ?3	? ? ? ? ? 4	?	? 5	? 6	? ?	? ?	? ?7	? ?	? ?	? ?8	? ?	? ?	? 9	? 10	? ?	? ?	? 11	? ?	? ?	? ?12	? ?	? ?	? ?13	? ?	? ?	? ?14 15	? ?	? ?	? ?16 17	? ?	? ?	? ?18	? ?	? 19	? ? ?	? ?20	? 16? ?2015	? InterDigital,	?Inc. ?All	?Rights	?Reserved. has	?a	?Configuration	?Tool oneMPOWER? ?supports	? a	?Web-? ?based	?tool	?to	?allow	? users	?to	?easily	?configure	? its	?setting. 17 Platform ? InterDigital?s oneMPOWER? is	?a	?secure	?and	? scalable	?horizontal	?platform	?that	?helps	? businesses	?launch	?and	?manage	?IoT	?applications	? ? It	?features	?a	?comprehensive	?suite	?of	?application	? enabling	?services	?that	?span	?connectivity,	?device,	? data,	?transaction,	?and	?security	?management	? ? 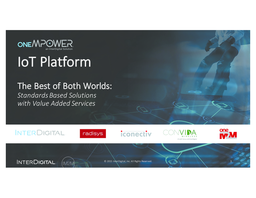 oneMPOWER?complies	?with	?oneM2M,	?the	? global	?standard	?for	?horizontal	?IoT	?platforms ? Designed	?for	?interoperability	?across	? diverse	?vertical	?markets,	?networks,	?and	? devices ? Open	?standard	?with	?a	?long-? ?term	?features	? roadmap	?and	?no	?single	?vendor	?lock-??in ? Maps	?and	?interworks	?with	?many	?existing	? industry	?protocols	?and	?alliances ? ?2015	? InterDigital,	?Inc. ?All	?Rights	?Reserved. 1	? ?	? ?	? ?2	? ? ? ? ? ?3	? ? ? ? ? 4	?	? 5	? 6	? ?	? ?	? ?7	? ?	? ?	? ?8	? ?	? ?	? 9	? 10	? ?	? ?	? 11	? ?	? ?	? ?12	? ?	? ?	? ?13	? ?	? ?	? ?14 15	? ?	? ?	? ?16	? ?	? ?	? ?17 18	? ?	? 19	? ? ?	? ?20	? Platform 18 DATA MANAGEMENT q? Data,	?device	? & services	? registration	? and	?discovery q? Data	?collection, management	? and	?storage q? MongoDB	?and	?SQLite	? databases	? support q? Data	?subscription, events,	? notification, and	?polling	?channel	? ? notification	? where	? NATs	?and	?firewalls	? are	? present q? Group	?related	? requests	? and	?bulk	?operations DEVICE AND	?SECURITY	?MANAGEMENT q? Device	? management	? ? integrated	? ?LWM2M	?or	?interfaces	? to	?external	? OMA	? DM	?&	?BBF	?TR-? ?69 q? Device	? firmware	? management,	? configuration	? &	?provisioning,	? and	?diagnostics	? &	?monitoring	? features q? Security	? enrolment	? ? credential	? pre-??provisioning,	? GBA,	?&	? remote	? provisioning q? Secure	? communication	? including TLS/DTLS	? and	?authentication	? ? PSK,	?PKI	? certificate	? &	?MAF q? Access	?control	?mechanisms ? ?2015	? InterDigital,	?Inc. ?All	?Rights	?Reserved. CONNECTIVITY AND	?TRANSACTION	?MANAGEMENT q? Service	? layer	? message	? routing,	?policies on	?the	?usage	?of	?underlying	? networks,	? and	?store-??and-??forward	? processing q? Event based	?offline	?charging	? ? charging	? policies configuration	? and	?charging	? records	? (CDR)	?collection q? Location based	?services	? populated	? by	?applications,	? from	?underlying	? network,	? and	?device	? GPS q? Interworking	? with	?other	? standards ? 3GPP	?MTC,	?AllJoyn,	? OIC,	?etc. q? Inter-??operator	? negotiation for	? service	? sharing SCALABILITY	? MANAGEMENT q? Server	? (datacenter/cloud),	? gateway	? and	?RESTful	? APIs q? Developers	? APIs,	?visual development	? and	?test	? tools,	?SDKs q? HTTP	?and	?CoAP	?transport	? layer binding q? XML	?and	? JSON	?data	? formats q? AMQP	?message	? bus	?for	?cloud	?deployments	? and	? federation Platform	?Features	?and	?Roadmap 1	? ?	? ?	? ?2	? ? ? ? ? ?3	? ? ? ? ? 4	?	? 5	? 6	? ?	? ?	? ?7	? ?	? ?	? ?8	? ?	? ?	? 9	? 10	? ?	? ?	? 11	? ?	? ?	? ?12	? ?	? ?	? ?13	? ?	? ?	? ?14 15	? ?	? ?	? ?16	? ?	? ?	? ?17	? ?	? ?	? ?18	? ?	? ?	? ?19	? ? ? ? ?20	? Focus	?Verticals ? ?2015	? InterDigital,	?Inc. ?All	?Rights	?Reserved. 19 Connected	?Industry ? Various	?industrial	?segments	?including,	?heavy	?equipment	?monitoring	? oil	?&	?gas,	?and	?aviation. Connected	?Health ? Solution	?based	?on	?oneM2M	?and	?Continua	?healthcare	?alliance	? standards ? New	?and	?innovative	?insurance	?models	?can	?be	?applied	?to	?assisted	? senior	?living,	?monitoring	?of	?chronic	?conditions,	?post-? ?operative	?care	? transitions,	?etc. Marketplace ? Multi-? ?municipality,	?multi-? ?partner	?smart	?transport	?pilot	?in	?the	?UK ? Integrated	?transport	?data	?marketplace	?that	?can	?be	?used	?to	?develop	? applications	?for	?better	?consumer	?transportation	?and	?commercial	? fleet	?management 1	? ?	? ?	? ?2	? ? ? ? ? ?3	? ? ? ? ? 4	?	? 5	? 6	? ?	? ?	? ?7	? ?	? ?	? ?8	? ?	? ?	? 9	? 10	? ?	? ?	? 11	? ?	? ?	? ?12	? ?	? ?	? ?13	? ?	? ?	? ?14 15	? ?	? ?	? ?16	? ?	? ?	? ?17	? ?	? ?	? ?18	? ?	? 19 20	? Device/Module	? Manufacturers System	? Integrators Network	? Operators Service	? Providers Software	? Licensing Platform	? as	?a	? Service Strategic	? Partnerships ? ?2015	? InterDigital,	?Inc. ?All	?Rights	?Reserved. 20 Flexible	?Business	?Models 1	? ?	? ?	? ?2	? ? ? ? ? ?3	? ? ? ? ? 4	?	? 5	? 6	? ?	? ?	? ?7	? ?	? ?	? ?8	? ?	? ?	? 9	? 10	? ?	? ?	? 11	? ?	? ?	? ?12	? ?	? ?	? ?13	? ?	? ?	? ?14 15	? ?	? ?	? ?16	? ?	? ?	? ?17	? ?	? ?	? ?18	? ?	? 19	? ? ?	? ?20	? 21 www.interdigital.com/iot ? ?2015	? InterDigital,	?Inc. ?All	?Rights	?Reserved.